Sarah Elizabeth Harvey (of Superior, NE) was born on October 15, 1923, to Franklin A. and Margaret Grace (Reed) Schott, on a farm near Mt. Clair, NE. 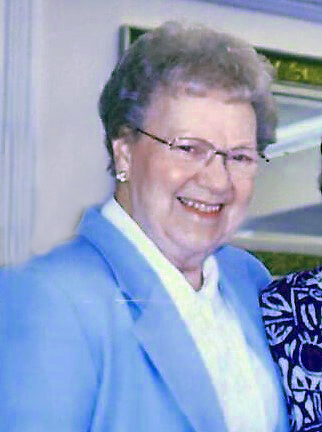 She departed this life on Monday, January 21, 2019 at the Good Samaritan Center in Superior, Nebraska at the age of 95 years. Sarah attended Antelope Country School and graduated from Nelson High School in 1941. On June 7, 1941, Sarah married Winston Flower. To this union were born David D. and Linda G. Flower. This marriage ended in divorce. She moved to Superior in 1960. She married Duane F Snyder on September 14, 1968. He was killed in an auto accident May 30, 1970. On April 11, 1973, she married V. Carroll Harvey, of Myton, UT. With this marriage came 4 stepchildren: Maurice, Patricia, Gene and Jane. Sarah was very active in the Myton Presbyterian Church and quilted weekly with the church ladies. To her children and grandchildren, she was known for the way she devoted herself to her family. You could always find her in the kitchen cooking or playing cards with family or friends. She knew each family members favorite dish or dessert and made each of them feel special by preparing it for them. Often times she was needed to do a farm equipment part run in town, and never hesitated to fit that into her schedule. She also did all the yard work and did the farm bookkeeping. No matter what the day brought, Sarah made life on the farm seem effortless, and was always cheerful and willing to do whatever she needed for the family. Sarah and Carroll retired from the dairy farm in Utah to Superior, NE in September 1991. Carroll died of cancer in August 1995. Sarah worked for Lincoln Tel & Tel for 5 years and Farmers State Bank for 12 years prior to moving to UT. She was a member of the First Presbyterian Church of Superior, NE, WCU of the Union Church of Hardy, NE and Broadstone Hospital Auxiliary, she also volunteered at the Niffy Thrifty. During the years between 1991 and early 2011, Sarah provided many dishes for church events, the Soup Suppers, and other gatherings. Sarah was proceeded in death by her husbands, parents, infant brother Lyvene, brothers Leroy, Ted, and Harold, son David and daughter Linda, and grandsons John and Ryan. Survivors are sister Charlotte (Bruce), brother Gene, stepchildren Maurice (Carolyn), Patricia, Gene (Kathie), (Robert Gardner - son in law) and Jane. Grandchildren: Jeremy (Rebecca) Gardner, Candace (Robin) Easterday, Sammi Gardner, Scott (Kellie) Harvey, Stacy (Carter) Trask, (Nicole Harvey), Mark (Amanda) Huffstetler, Susan (Lance) Magee, Kyle Harvey, Great grandchildren: Miles, William, Caleb, Zoey, Navaeh, Aaryanna, Natalie, Carissa, Kaylee, Lily, Jordan, Marcos and Issac. Numerous nieces, nephews, cousins and friends. Sarah was loved deeply by all her children and grandchildren and will be missed. Funeral services were Saturday 1:00 pm, January 26, 2019, at the First Presbyterian Church in Superior, Nebraska with Rev. Don Canady officiating. Music was provided by Donna Cox with congregational hymns: "I Love to Tell The Story", "What A Friend We Have In Jesus" and "Amazing Grace". Casket Bearers were: Jeremy Gardner, Brad Williams, Bruce Williams, Royce Schott, John White and Brad Holmer. Burial was at the Evergreen Cemetery, in Superior, Nebraska. Memorials may be given to the Presbyterian Church.